La Siriola – one of Northern Italy’s best restaurants awarded with two Michelin stars is a must-go to for every gourmet and Michelin-guide-based-traveller. A young dynamic team with passion lead by the 29-year old Matteo Metullio is in charge for bringing new and wonderful combinations to the classic Italian cuisine. The combination of simple, yet local ingredients and fresh and young preparation methods making the dinner at this restaurant so unforgettable. Not only having an outstanding team in the kitchen is necessary to offer a high quality dinner, also the service is brilliant and during dinner you can explore the world of fine dining with amazing surprises and unique excursions you won’t expect. That’s the real difference a highly awarded restaurant makes. After a tour through the hotel and the other restaurants of the property we came back to La Siriola where the owner of the house was waiting for us to finally welcome us and to initiate our dinner. As a part of our tour we could visit the exquisite and impressive wine cellar with the adjacent cheese room – a must visit for all cheese lovers. The menu is presented in a special way they print out the five or eight course menu - depending on your wish - put them on wine labels and stick it on jeroboam bottles. A innovative way of offering the menu was accompanied by an individual aperitif which is made in front of the guest, we had two freshly prepared Bellinis with peach puree and raspberries. They served a variety of amuse bouches before the main dinner. One was a clear consommé of deer the other plate was a spicy sponge with red garlic and a slice of lobster, a fresh made Vitello tonnato in the mug and a fake Aubergine which was filled with Parmesan cheese. The second amuse bouche was a plate of potato chips served with scallops spiced up with wasabi. A wonderful and fresh combination. With this plate they served a glass of white wine from the Veneto region which was called Garganaga a light a slightly sweet wine which matched perfectly to the fish courses. The first main course were homemade tagliatelle with crispy almonds and tuna topped with a Saffron sauce. The dish itself was like a piece of art, on top the shiny yellow sauce and underneath the black squid ink coloured pasta. A tartar of deer with caviar of eel and smoked eel was the next plate - a very interesting way of surf and turf - but also very harmonic in taste. The next course was a pasta plate again, for me the best thing in Italy, terellini filled with calf tongue and topped with basil, paprika and a consommé of guinea-fowl. The next main course were sweetbreads with an espuma of carrots and fresh Spinat on top of homemade mashed potatoes. Last but definitely not least was a lamp with morels and mashed goat cheese. All combinations were kind of new for us but with a wonderful taste and feeling in the mouth and it was nothing too overwhelming or too much - just perfect. Now it was time for the HIGHLIGHT of the night: the chocolate room. The guests are guided to a separate area with hundreds of different kinds of chocolate, starting with an after eight ice cream. A homemade mint base which was immersed in the chocolate fountain. After that you could choose whatever you wanted. All chocolate based wishes will be fulfilled after that experience. 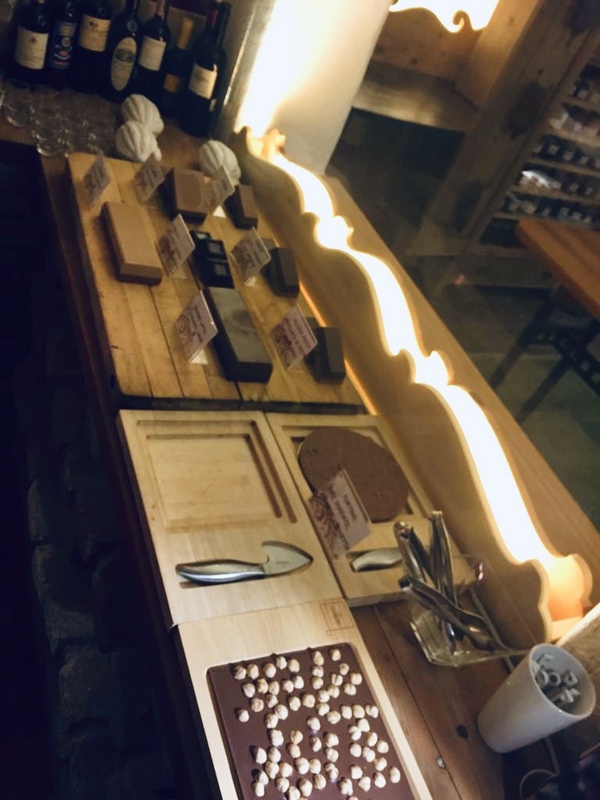 They offer at least 5 types of nougats, 50 different pralines, fruits sheathed in chocolate and of course chocolate with every percentage of cocoa up to a 100%. At the end they finished the night with a trio of chocolate, a dark and a white chocolate mousse and cookies served with sour cherries and the perfect wine selection a Tramin sweet wine from the region Alto Adige. We were hosted for the dinner at La Siriola by Ciasa Salares Hotel. However all above written expresses our own opinion and has not been influenced.